There are no minimum requirements on standard embroidery services. When adding an item to the cart, please indicate which items you would like to have embroidered. You must select the thread color, letter type (block or script), letter size, and embroidery placement/location. Standard embroidery adds a few weeks to delivery time, and embroidered items cannot be returned. For details on customized logos and embroidery and screen printing options, please contact us directly. For our corporate customers, we offer CROS (Customer Remote Ordering System). CROS was, and is, developed and maintained in-house and has been an evolving software solution for the past ten years. This multi-tiered program allows simple shopping cart-style ordering to managed ordering from one or more locations to a management module with complete reporting capabilities. Track orders, employee expenses and inventory with our package. Contact your sales representative for more information. At no additional charge, we will package each of your employees uniforms in separate bags clearly labeled with your employees name. You no longer need to figure out who ordered what products and sizes. You need only hand out bags.  Hanover Uniform will accept, for return or exchange, any garment, as long as it has not been worn, altered or embroidered; exchanges must be made within thirty days of delivery. You must contact our Customer Service Department for a Return Authorization Number before returning the item; please include the invoice number, the size, and the quantity of the garments, which are to be returned. Returns will not be accepted without a valid RA Number. We recommend shipping returns via UPS, or insured Parcel Post. We stand 100% behind our products. If there is a defect in workmanship, of any kind, we will replace the defective garment, at no cost to you. If you are not completely satisfied with your order, please contact our Customer Service Department, and we will reorder the garment and issue you credit, upon receipt of the defective merchandise.